Artist and engraver: Sanders, J. 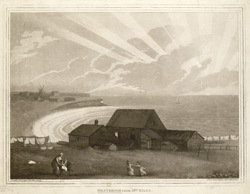 View of Westbrook from Mrs Hill's house near Margate. Margate was the most important fishing village on the Isle of Thanet which in the late 18th century had also become popular as a sea-bathing resort. Westbrook was a village to the west of Margate along the coast. This view shows a house in a windy position on the cliffs, the bay, beach and also a windmill in the distance.